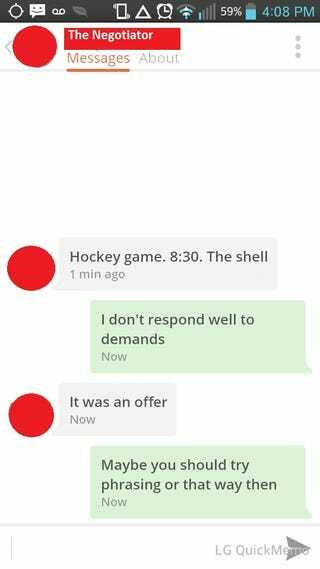 Here are some recent Tinder conversations for you. I hope they amuse you as much as they amused me. First, the Negotiator. He then asked me out and unmatched me within five minutes. Damn, son. Unfortunately, I missed taking screenshots of two parts of the conversation, since he unmatched me pretty quickly after we finished talking. Feel free to fill in the gaps as amuses you.